Ground cherries (Physalis pruinosa), hardy in U.S. Department of Agriculture plant hardiness zones 8b through 11, look like a cherry tomato (Lycopersicon esculentum), hardy in USDA zones 10 through 11, covered with a paper husk. These little exotic-looking tart-sweet fruits are perfect for preserves, and they're bound to start a conversation, as in, "Why do your tomatoes have husks on them?" 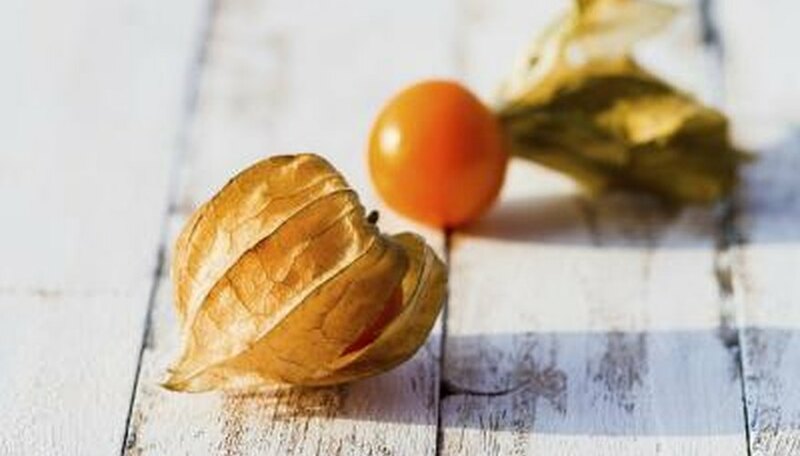 Ground cherries grow at their best in full sun, generally six or more hours per day, and loamy, well-draining soil. If you struggle with heavy clay soil, grow ground cherries in 12-inch-tall or taller raised beds and fill the beds with loamy topsoil. Give ground cherries about two inches of water per week. If it's raining regularly, water less. A rain gauge helps determine how much rain your garden is actually getting and how much, if any, additional watering it needs. Stop watering if the soil gets soggy, and allow the top two to three inches to dry out. Ground cherries tolerate drought stress better than wet roots. Ideally, space ground cherry plants 3 feet apart. This generous spacing gets the best yield and it makes getting between the bushes to harvest easier. When space is limited, you can grow ground cherries as close as 1 foot apart. After planting the seedlings, set up 12-inch-diameter tomato cages around each plant to create a support structure as the plants grow. Without a cage or support system, ground cherries will sprawl across the garden, taking up more room then they need to. A cup of mushroom compost per plant mixed into the bottom of the planting hole at planting gives ground cherries a boost right away. When the first flowers start to bud out in late spring, add fish emulsion fertilizer to the soil around each plant to provide extra nutrients for the fruit production stage of the season. Dilute 2 tablespoons of fish emulsion in 1 gallon of water in a watering can or sprayer. A single gallon covers a 25-square-foot ground cherry planting area. Spray the fertilizer on the soil around each plant. If you're short on garden space, you can grow a ground cherry plant in a 2-gallon-container on the porch or patio; make sure it has drainage holes in the bottom. Use standard potting soil and set a 4-foot-tall tomato cage around the inside edge of the planter. Water when the top of the soil starts to dry out one to two inches deep. Keep an eye on the moisture, especially in hot, dry weather when containers can dry out within a single day. Use 1 cup of diluted fish emulsion fertilizer at planting and again when the flowers bloom. Before applying, dilute the fertilizer at a rate of 1 tablespoon per gallon of water. Zipcode Zoo: Physalis Pruinosa "Goldie"